Ultimately, is an upstairs/downstairs exercise. Go up a number of steps and then come down a few and meet in the middle. Tawadros II, the new Coptic-Orthodox Patriarch of Egypt, had to go up three steps during his enthronement ceremony. At every step, one of his titles was proclaimed: bishop of bishops, head of pastors, Pope and Patriarch of Saint Mark’s Chair. Then, he promptly came down these steps, to visit the Patriarchs and leaders of the Christian Churches of Egypt. Among them, the new Patriarch of the Coptic-Catholics, Ibrahim Isaac Sidrak. The latter chose as patriarchal motto a quote from Paul’s second letter to the Corinthians: «He reconciled us with him through Christ and entrusted us with the reconciliation mystery.» Communion and reconciliation are the keys that can bring about a new dialogue and –why not?– a reunification of the “sister churches”; keys that can open many doors, in the year of the five patriarchs. In the months prior, Tawadros II was elected patriarch of the Coptic Orthodox; Sidrak was elected patriarch of the Coptic Christians. Even the Greek Orthodox Church of Antioch has a new patriarch: John X was elected last December 17, succeeding Patriarch Ignatius IV Hazim, who died at age 92 on December 5; on January, 24, Nourhan Manougian was elected Jerusalem Armenian apostolic Patriarch, and a few days ago he received a visit by Fouad Twal, Latin Patriarch of Jerusalem, and from other Christian Churches representatives.In addition to these new Patriarchs, Bechara Boutros Rai, Maronite Patriarch of Lebanon, was created cardinal in the last concistory. Three of these patriarchs are part of the Catholic Church, and got the ecclestica communio (ecclesiastic communion) from the Pope. Two of them are not part of the Catholic Church, but are part of that ecumenical movement that seems to advance rapidly with respect to relations between the Catholic Church and Christian Eastern Churches. So quickly that an ecumenical meeting between Benedict XVI and the Russian-Orthodox Patriarch Kirill seems ever more possible –Finland is the country most recently mentioned as a candidate to host an unprecedented meeting between the two leaders. 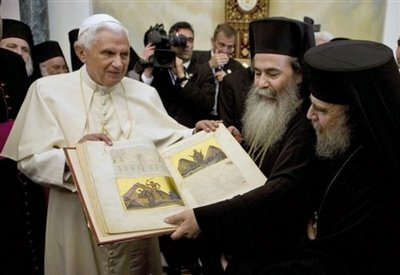 Meanwhile, the Pope and the heads of eastern churches often exchange fraternal messages. 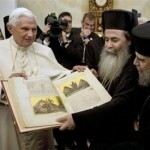 A great harmony has always reigned between the Pope and the Patriarch Bartholomew I in particular. There are more difficult challenges looking west. Not particularly with the Anglican Church. Yes, Westminster has a new primate, Justin Welby. But his relationships with the Catholic Church will be as good as his predecessor’s. A former manager in oil companies, Welby has often noted that he was educated in the Social Doctrine of the Catholic Church. Yes, he is very open to the ordination of women bishop and gay priests. But this is foremost an Anglican internal problem rather as of yet a problem for ecumenical dialogue. Will these tensions be overcome? Perhaps the answer is in what Paul VI said when he first met Patriarch Athenagoras: «Let us live a fraternal life and let us pray for the theologians.» Theologians have in fact done a lot for the ecumenical dialogue, especially with regards to the schism between the Church with the eastern churches. Steps to overcome the schism are ongoing: they began with the reciprocal revocation of excommunication and extend to the outcome declaration of the 2007 Ravenna ecumenical-theological meeting. In that document, the bishop of Rome is defined as protos (the first) among the patriarchs, albeit how to exercise this «primacy» is yet to agreed on. In the meantime, Benedict XVI undertook specific actions. For example, extending more frequently the berretta rossa to the heads of oriental churches in communion with Rome. This tradition was introduced by Pope John XXIII, and followed by Paul VI, John Paul II and Benedict XVI. Some theologians maintained that the cardinal title (i.e. a Roman clergy member, and thus an elector of the Pope, who is the bishop of Rome) cannot be given to a patriarch. Patriarchs –these theologians maintain– have a greater dignity (almost on par with the Pope’s) than cardinals. Furthermore, patriarchs are part of a tradition different from the Latin tradition. Benedict XVI, nevertheless, has chosen to reinforce the Church’s unity over these theological considerations. The last action of this kind was the creation of cardinal of Bechara Boutros Rai, Maronite Patriarch of Lebanon. Just a few days ago, it was announced that the new cardinal would help two young Lebanese charged with writing the Good Friday Via Crucis meditations. The Pope continuously refer to Lebanon as an example of religions’ cohabitation, and this is even more important considering the difficult situation of Middle-East countries, where the Arab Spring has been a Winter for Christians. That is why having five new patriarchs and a new cardinal-patriarch is an important development. At a difficult time for Christians, ecumenical dialogue and overcoming the scandal of the division among Christians are necessary to preserve Christian communities. The year of the five patriarchs is a chance for unity. che il Papa abbia perso molto peso è evidente. Ma è anche vero che ha da un po’ un po’ qualche fastidio che non gli permette di camminare con scioltezza se deve fare lunghi tragitti a velocità lenta (tanto è vero che usa la pedana)e che in questi casi una persona ben curata si mette a dieta per “alleggerire” il peso sulle ossa. Che sia invecchiato anche è evidente. Ma resta tutto da vedere. Resta la preghiera!